Kerr-Vance Academy salutes Josh Monahan, KVA Class of 2013! 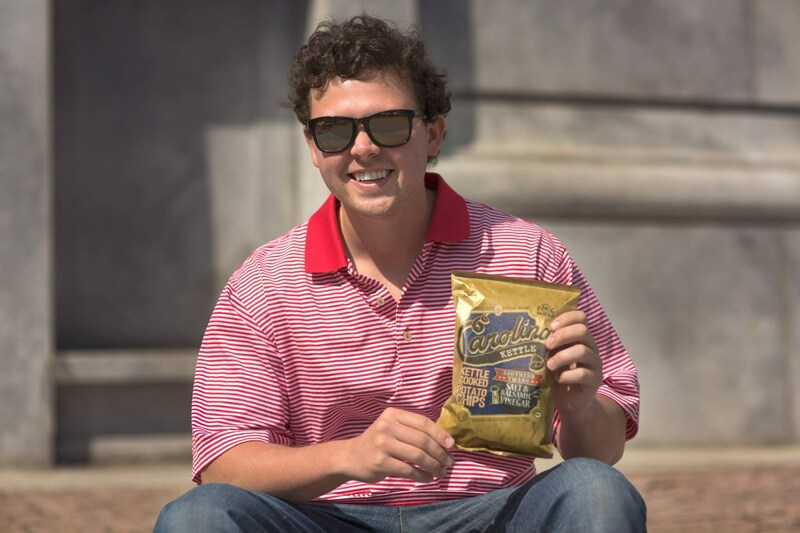 Josh recently graduated from North Carolina State University and has since started his own snack food company, Carolina Kettle. My name is Josh Monahan. My family has been in the snack food industry for sixty-five years, and growing up, I always knew that I wanted to continue that tradition. Two years ago I started making plans for a food company of my own. With hunger being such a serious problem in America and learning that 1 in 6 people in this country do not know where their next meal will come from, I decided to name my company 1 in 6 Snacks. My vision was to sell great-tasting products while being able to give back to local food banks at the same time. I am excited to announce that 1 in 6 snacks has become a reality. My first product is Kettle Cooked Potato Chips and the brand name is Carolina Kettle. The first size that I am offering is a 2-ounce bag. For each of these bags sold, 1 in 6 snacks will donate 5 cents to your local Food Bank. I need your help to spread the word. Please like and share our company here on Facebook and also follow us on Instagram @Carolina Kettle and on twitter @Carolina_kettle. Visit www.1in6snacks.com and order today.